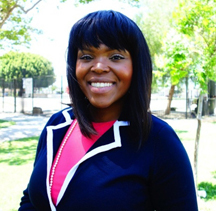 In an election that pitted Compton’s past against its future, Aja Brown brought a burst of youthful energy, a USC master's degree in planning and almost a decade of experience working in cities, to the hub city’s mayoral seat. Brown, an urban planner pounded former mayor Omar Bradley with 63.7 percent compared to 36.2 percent of the vote. She captured 4,143 votes and Bradley got 2,360 votes. The Compton city clerk office confirmed the results to the Sentinel late Tuesday evening and will certify the election results on Monday June 10. On a relatively quiet night in the hub city where a slight breeze blew eastward on Compton Blvd., the woman who was destined to become the second female elected mayor in the history of Compton was at her noisy campaign office. Brown, 31 posed for photographs and shook hands while her supporters wearing white Aja T-shirts made loud chatter as the voters went to the polls to decide whether they would pick someone who represented what Compton was or someone who represented what Compton can be. It was clearly an election that hinged on the past versus the future and in the end voters made it clear that they were putting their trust in the hands of the future---Aja Brown. “I believe that timing is everything and the city of Compton was ready for a change,” said Brown. Brown worked in Compton’s planning department from 2009 to 2011 and at the height of the abyss and pending layoffs left to take a new job elsewhere. “I was offered to stay on and even be promoted although I didn’t meet the qualifications, but I decided against it because it wasn’t right,’ she explained. Disappointed and hurt by the leadership of the city where she grew up, Brown went back four years ago, vowed to run for mayor and make a change at the top. Compton is recognized as the birthplace of rap music and has produced the likes of Eazy E, Dr. Dre, The Game and also was responsible for tennis superstars Venus and Serena Williams who grew up there. However, since moving to South Florida and dominating the world of women’s tennis, they have yet to come back to Compton. “If someone wanted to give back where would they give back to? There has not been a clear channel to establish an opportunity for them to give back,” Brown told the Sentinel. Brown realizes that the task before her over the next four years will not be easy but she believes that she is prepared for it. In other Compton election results, Issac Galvan became the first Latino elected to City Council when he defeated incumbent Lillie Dobson 603 (60.0 percent) to 402 (40.0 percent).